I had to post about this. Now, I'm not one to try things you see on infomercials and whatnot, but I had to try this. It was calling me. I never towel dry my hair. But when I deep condition, I don't like putting a mega large towel on my head. It's heavy and I just don't like it. But I digress. So, I always see them in CVS and I thought,eh, it's $7.00, why not. When I got home, I washed my hair and added deep conditioner. I then put on my plastic cap and whipped out my Turbie Twist. It really is impressive. The cool thing about it is the loop in the back. All you do is put the towel on your head, twist the front and insert the front of the towel into the loop in the back. That's it. You're done. This stays in place, it's gentle on your hair and did I forget to mention it stays in place, even with all of my hair? Seriously, you can't beat this. 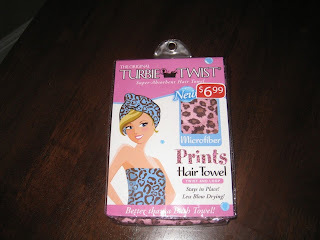 I LOVE Turbie Twists!!!! I have been using them for years :) Great find! @summerbreeze - they come in a wide range of colors. It may very by CVS location; however, you can get them at Bed Bath and Beyond, also.